1929. Advert. in British Industries Fair catalogue. of 58/62 Grays Inn Road, London, WC1 (1922), shopfitters. Frederick Sage and Co Ltd were shopfitters, at Grays Inn Road from their reconstruction in the 1870s to the destruction of those premises in the Blitz on 17 April 1941. This company was a substantial employer in the area with an international practice, including the design of La Rinascente in Milan. 1860 Company founded by Frederick Sage. Original partners were his three nephews Jesse Hawes, Frederick Hawes, Josiah Hawes and Frederick George Sage. 1876 Won an award at the Centennial Exhibition in Philadelphia of an 'air tight showcases'. c1900 Fitted out Harrods department store in Knightsbridge, London. 1905 Incorporated as a limited company. 1907-1909 Fitted out other department stores in London, namely D. H. Evans in Oxford Street and Selfridges. 1914 Show Case and Shop Front Fitters at Gray's Inn Road. Directors: Frederick George Sage (chairman); F. Debenham; G. Moody; W. Denny; G. A. Coulson, General Manager. Specialities: Air tight show-cases, shop front fittings, high class joinery, fittings of all kinds for Banks, Museums and Offices. Also supply metal work, revolving shutters, facias, signs, etc. 1915 Patent granted for hinges for aeroplane wings. The invention was for the wings of aeroplanes, which were staggered, (where the upper plants is in front of or behind the lower), may be folded back to lie alongside the fuselage of the machine. It was necessary to keep the wings above one another in order to allow them to fold, as the hinges were rigidly attached to the main spars of the wings (patent number 15,014). 1916 Set up a aircraft design team where four different aircraft were designed, but a total of only 5 were built. After the War, company resumed shopfitting. 1921 Involved with the rebuilding of the Galeries Lafayette in Regent Street. 1922 Manufacturer (Engineering Section): Internal combustion engines suitable for motor-cars, launches, etc. Also export agents for "Riley" and "Alvis" cars. 1941 April 17th. Main factory and office premises in Gray's Inn Road were bombed and entirely destroyed. After WWII the company was involved in numerous refurbishment works for shops, ships, churches, musuems, but the longest post-war project was in the Palace of Westminster following the bombing of the House of Commons. 1949 Carried out the decoration of the tourist rooms and stairs on the P and O liner 'Himalaya'. 1951 One of the main contractors in the construction of the TSS Ocean Monarch. 1953 Fitted out the public rooms with other contractors on the Greek Line Steamship 'Olympia' which was built for the expanding tourist travel industry. 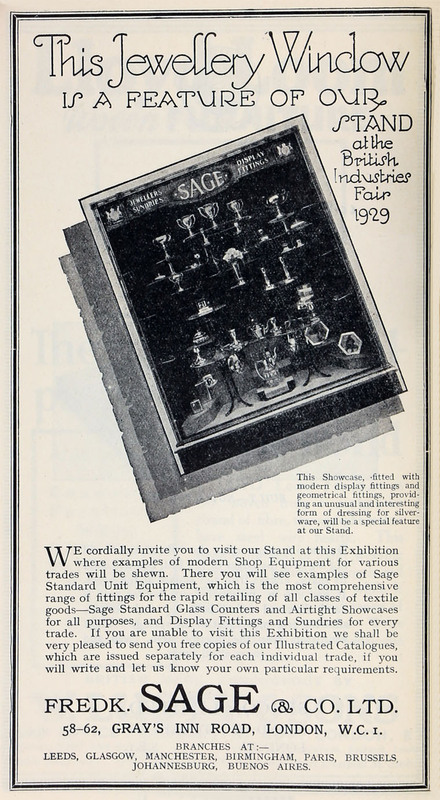 1961 Architectural metal craftsmen and contractors and manufacturers of shop and store fittings shop front and showcases. 1968 Frederick Sage and Co became a subsidiary of British Electric Traction. 1989 Merged with Brent Metal and moved to Wembley. After a few more years it became part of Courtenay Pope Holdings before its demise. This page was last edited on 10 November 2018, at 12:47.